^ 1.0 1.1 1.2 1.3 1.4 1.5 1.6 Commemorative Biography, p. 9. ^ 3.0 3.1 3.2 3.3 Kennedy et al, p. 220. ^ 5.0 5.1 Commemorative Biography, p. 17. ^ 9.0 9.1 Van Bolt, pp. 155–157. ^ 10.0 10.1 10.2 10.3 Commemorative Biography, p. 10. ^ Russel, p. 201 n.38. ^ Commemorative Biography， p. 10; Freehling 1990， p. 559. ^ 18.0 18.1 Commemorative Biography, p. 11. ^ 19.0 19.1 Freehling 2007, pp. 136–141. ^ 20.0 20.1 20.2 20.3 Freehling 2007, pp. 142–144. ^ 23.0 23.1 23.2 23.3 Commemorative Biography, p. 13. ^ 25.0 25.1 25.2 Nicholas, p. 545. ^ 27.0 27.1 27.2 Commemorative Biography, p. 14. ^ 28.0 28.1 28.2 Draegart 1956a, pp. 25–26. ^ 34.0 34.1 Jordan, p. 281. ^ Philipp， pp. 43–44; House， p. 185. ^ 42.0 42.1 42.2 Jordan, pp. 297–301. ^ 43.0 43.1 Jordan, p. 306. ^ 45.0 45.1 Commemorative Biography, p. 18. Clancy, Herbert J. The Presidential Election of 1880. Chicago, Illinois: Loyola University Press. 1958. ISBN 978-1-258-19190-0. Dubin, Michael J. United States Congressional elections, 1788–1997 : the official results of the elections of the 1st through 105th Congresses. Jefferson, North Carolina: McFarland & Co. 1998. ISBN 978-0-7864-0283-0. Freehling, William W. The Road to Disunion: Volume 1 Sessionists at Bay 1776–1854. New York, New York: Oxford University Press, USA. 1990. ISBN 0-19-505814-3. Freehling, William W. The Road to Disunion: Volume 2 Secessionists Triumphant 1854–1861. New York, New York: Oxford University Press, USA. 2007. ISBN 0-19-505815-1. Jensen, Richard J. The Winning of the Midwest: Social and Political Conflict, 1888–1896 2. Chicago, Illinois: University of Chicago Press. 1971 [2014-11-04]. ISBN 0-226-39825-0. Jordan, David M. Winfield Scott Hancock: A Soldier's Life. Bloomington, Indiana: Indiana University Press. 1996 . ISBN 0-253-21058-5. Kennedy, E.B. ; Dillaye, S.D. ; Hill, Henry. Our Presidential Candidates and Political Compendium. Newark, New Jersey: F.C. Bliss & Co. 1880 [2014-11-04]. OCLC 9056547. Nicholas, Stacey. William Hayden English. (编) Bodenhamer, David J.; Barrows, Robert G. The Encyclopedia of Indianapolis. Bloomington, Indiana: Indiana University Press. 1994: 544–545 [2014-11-04]. ISBN 0-253-31222-1. Official Proceedings of the National Democratic Convention. Dayton, Ohio: [Dayton] Daily Journal Book and Job Room. 1882 [2014-11-04]. Worth, Richard W. English Hotel and Opera House. (编) Bodenhamer, David J.; Barrows, Robert G. The Encyclopedia of Indianapolis. Bloomington, Indiana: Indiana University Press. 1994: 546–547. ISBN 0-253-31222-1. Zeigler, Connie J. Banking Industry. (编) Bodenhamer, David J.; Barrows, Robert G. The Encyclopedia of Indianapolis. Bloomington, Indiana: Indiana University Press. 1994: 291–293 [2014-11-04]. ISBN 0-253-31222-1. Some Letters of Jesse D. Bright to William H. English (1842–1863). Indiana Magazine of History. 1934-12, 30 (4): 370–392. JSTOR 27786698. Craig, Berry. William English Walling: Kentucky's Unknown Civil Rights Hero. The Register of the Kentucky Historical Society. Autumn 1998, 96 (4): 351–376. JSTOR 23384145. Draegart, Eva. The Fine Arts in Indianapolis, 1875–1880. Indiana Magazine of History. 1954-06, 50 (2): 105–118. JSTOR 27788180. Draegart, Eva. Cultural History of Indianapolis: The Theater, 1880–1890. Indiana Magazine of History. 1956-03, 52 (1): 21–48. JSTOR 27788327. Draegart, Eva. Cultural History of Indianapolis: Literature, 1875–1890. Indiana Magazine of History. 1956-12, 52 (4): 343–367. JSTOR 27788390. Elbert, E. Duane. 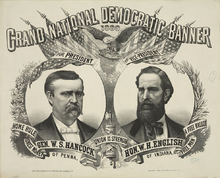 Southern Indiana in the Election of 1860: The Leadership and the Electorate. Indiana Magazine of History. 1974-03, 70 (1): 1–23. JSTOR 27789943. House, Albert V. The Democratic State Central Committee of Indiana in 1880: A Case Study in Party Tactics and Finance. Indiana Magazine of History. 1962-09, 58 (3): 179–210. JSTOR 27789008. Russel, Robert R. The Issues in the Congressional Struggle over the Kansas-Nebraska Bill, 1854. The Journal of Southern History. 1963-05, 29 (2): 187–210. JSTOR 2205040. doi:10.2307/2205040. Van Bolt, Roger H. Indiana in Political Transition, 1851–1853. Indiana Magazine of History. 1953-06, 49 (2): 131–160. JSTOR 27788097. Zywicki, Todd J. Beyond the Shell and Husk of History: The History of the Seventeenth Amendment and its Implications for Current Reform Proposals (PDF). Cleveland State Law Review (Cleveland-Marshall College of Law). 1997, 45 (1) [2013-11-10]. ISSN 0009-8876. （原始内容存档 (PDF)于2013-01-15）. Philipp, Ernest Joseph. Chapter 5: The Democratic National Convention. The Presidential Election of 1880 (M.A. thesis). University of Wisconsin. 1917 [2014-11-04]. Betty Alberty; Ruth Leukhardt; Paul Brockman; Pamela Tranfield (编). William Hayden English family papers, 1741-1928 (PDF). Manuscript and Visual Collections Department, William Henry Smith Memorial Library. Indianapolis, IN: Indiana Historical Society. 2003-01-08 [2014-11-04]. （原始内容存档 (PDF)于2012-12-22）.